The presidential race between Barack Obama and John McCain is now even at 42 percent, according to a new CBS News poll conducted Monday-Wednesday of this week. Twelve percent are undecided according to the poll, and one percent said they wouldn't vote. This is in contrast to a poll conducted last weekend, where the Obama-Biden ticket led McCain-Palin by eight points, 48 percent to 40 percent. see yesterday's poll on Palin). But in interviewing done yesterday, 83 percent of registered voters said that spouse and family of a candidate will not affect their votes. Other factors within the race and overall opinions of the candidates, however, have remained similar from this weekend. Thirty-eight percent say they have a favorable view of Obama, compared 34 percent unfavorable and 27 percent undecided. For McCain, it's 37 percent favorable, 36 percent unfavorable and 27 percent undecided. McCain maintains his large advantage on the likelihood of being an effective commander-in-chief - 46 percent of voters say it is "very likely" McCain would be an effective commander-in-chief, compared to 24 percent who say that about Obama. But McCain still has one big deficit to make up -- just 44 percent of voters say he understands their needs and problems, compared with 60 percent who say that about Obama. In the poll, Obama continues to have a lead with women voters, 43 percent to 38 percent, while McCain has the edge with men, 46 percent to 41 percent. As has been standard in this campaign, voters under age 45 are backing Obama, while older voters are supporting McCain. 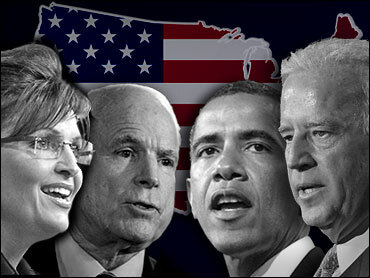 McCain wins the support of married voters and Obama has the backing of voters who are not married. It should be noted, though, that most married voters are older while those who are not married tend to be younger. Independents in this poll are divided. In the poll conducted over the weekend, Obama had a six-point advantage with this group, but now the lead is three points, 39 percent to 36 percent. The poll also shows that the majority of Clinton supporters continue to support Obama - 67 percent in this poll, up from 58 percent last weekend. McCain has seen a similar uptick from white evangelicals since the weekend - 66 percent now, up from 57 percent. This poll was conducted among a random sample of 835 adults nationwide, including 734 registered voters, interviewed by telephone September 1-3, 2008. Phone numbers were dialed from RDD samples of both standard land-lines and cell phones. The error due to sampling for results based on the entire sample could be plus or minus three percentage points; for registered voters the sampling error could be plus or minus four percentage points. The error for subgroups is higher.